Yellow concealer is effective for hiding redness and dark circles. Concealer goes on your face after you cleanse and moisturize but before you apply foundation. Women use concealer because makeup alone is not always enough for good coverage. When pink skin-toned concealers do not lend the coverage you need, you may need to switch shades. Everyday blemishes are a cinch to hide, but ugly discolorations are more challenging. When hyperpigmentation or redness is a problem for your skin, you should use a yellow concealer. The yellow shade counteracts red splotches and dark colors. These skin issues often occur as women age and venture out into the sun unprotected. Yellow concealers combine mineral oil and bright pigments for optimum camouflaging. Yellow colored concealers do not stain the skin. This makeup simply washes away with soap and water. Yellow-based concealer does not have to blend into your skin. Remember you will be using foundation makeup to get your flawless finish. Apply the yellow product to shadowed or spotted areas of the face for a more youthful, perfect look. Do not over apply the concealer, or you may end up with an uneven makeup look. Yellow tinted concealers can do the following. This shade of concealer works by combating the pink, purple, or dark blemishes or marks on the skin. The yellow color helps balance the flaw or mark and create a more even base to apply your foundation to. Cleanse your face as you normally would. Rinse with cool/warm water. Moisturize your skin with a facial moisturizer. Pat your skin dry again to remove excess moisturizer. Apply a facial primer to your skin. This will "grab" the concealer and keep it in place longer. Squirt a tiny amount of the concealer out of the tube on to the tip of your finger. Dab the concealer on the area patting it slightly with your finger pads. Don't rub or force the product into your skin. Allow the concealer to dry for 30 seconds to one minute. 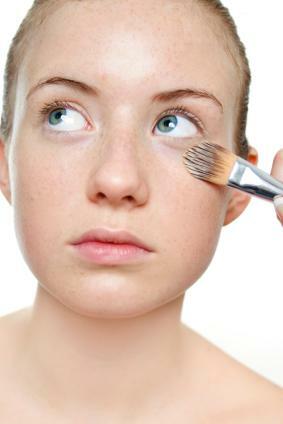 If you are applying mineral powder foundation, you should use a yellow mineral powder concealer instead of a liquid. You can find yellow tinted concealers at most fine department stores or cosmetic supply stores. Although there are many makeup brands that carry this type of corrective concealer, Clinique and Mary Kay are two trusted names that offer yellow-based corrective concealers. Find Clinique products at department stores or online at their Clinique website. Their new Redness Solutions Targeted Corrector has a smooth glide to it that allows you to apply it on the fly. This gentle yellow color is not as bold as some but still effective. The product comes in a lipstick-style tube. You can purcashe this product via the Clinique website or at majpr department stores where Dlinique products are sold. Hide your blemishes with Mary Kay Concealer. This product comes in a small .3 ounce tube. This shade of yellow is brighter than most, so it only takes a drop for effective coverage. You can purchase the concealer from a local Mary Kay consulatant or online at the company's website. Using a yellow tinted concealer may restore your beauty confidence. This product hides blemishes better than just makeup alone. If you have moderate to severe rosacea, however, be sure to talk to your dermatologist before trying new cosmetic products.